I decided to stitch a little on Quaker Alphabet to decide the colors I wanted to use for it once and for all. I decided on Sampler Thread Brethren Blue and Weeks Dye Works Onyx. I'm stitching it two over two. The 35 ct. linen by Weeks Dye Works is really nice to work with so far. I also decided to get back to Hanky Pysanky last night. I finished up the motif to the left of the big diamond. Well, nothing else going on here. Watching all the kids today. My mom is sick now. I don't know if she has what I had, or just has a migraine. I told her to lay down and I would watch my niece. I may take them somewhere to get them out of the house. Write later! Great start! And perfect choice of clours. They're both looking great! I really like the colors you've chosen for Quaker Alphabet. I love the colours you have chosen for your Quaker Alphabet. More great progress on HP too. Love your Quaker Alphabet start! I'm going to have to get that chart now, I love how the colours are stitching up. I absolutely love both of these projects! How do you tear yourself away from them? I approve of your color choice. ;) Both are beautiful projects and I really enjoy your pictures. Great color choice for the QA! The colors for Quaker Alphabet look wonderful, love watching your progress on Hanky Pysanky. 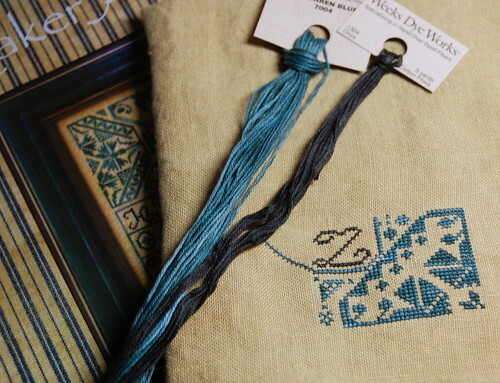 Garder looks great, you are such and inspiration, always stitching and finishing projects that I love. Yummy srummy, LOVE that Quaker start!!! Hanky ... is good too. Love your work as always! The Quaker Alphabet is looking great! Perfect choice of threads. I love the colors that you picked out! Nice new start and HP is looking good - though shame the fish disappeared I liked them lol. You do such nice work. New start looks great. Good choice. HP looking good too. You are so ambitious to do it on black. I like so much La d da quaker's but at this moment it's impossible find it in Europe, i?ll wait for this. So pretty! I was hoping you'd choose the Brethren Blue! Love Hanky too - it's just breathtaking. Beautiful embroidery. 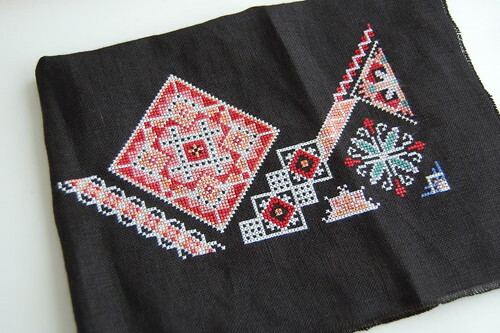 I started some traditional Ukrainian embroidered place mats about 15 years ago. It's still a work in progress. hehe. I just pulled my dyes out and started my pysanky for the year. You should show photos of yours!